Best Tuner for Harley 103 Reviews: Top-5 in April 2019! Harley Davidson introduced its 103 cubic inches (1688cc) V-twin in 2012 as a standard size for the Softail and Touring models. Today, the Twin Cam 103, is found in a number of models and years, including 2003–2006, 2009, 103 cubic inches (1,690 cm³). It is a standard on 2011 Touring models: Ultra Limited, Road King Classic, and Road Glide Ultra and optional on the Road Glide Custom and Street Glide. Standard on most 2012 models excluding Sportsters and 2 Dynas, and a Standard on all 2014 Dyna models. As a Harley Davidson owner, you want a device that will promote the performance of your bike, and this article brings you the best autotuner units that help you adjust air and fuel for better performance, higher HP and improved throttle response, for bikes that use fuel injection technology. In this article, I present you with the top 5 tuners for Harley 103 twin cam engines. 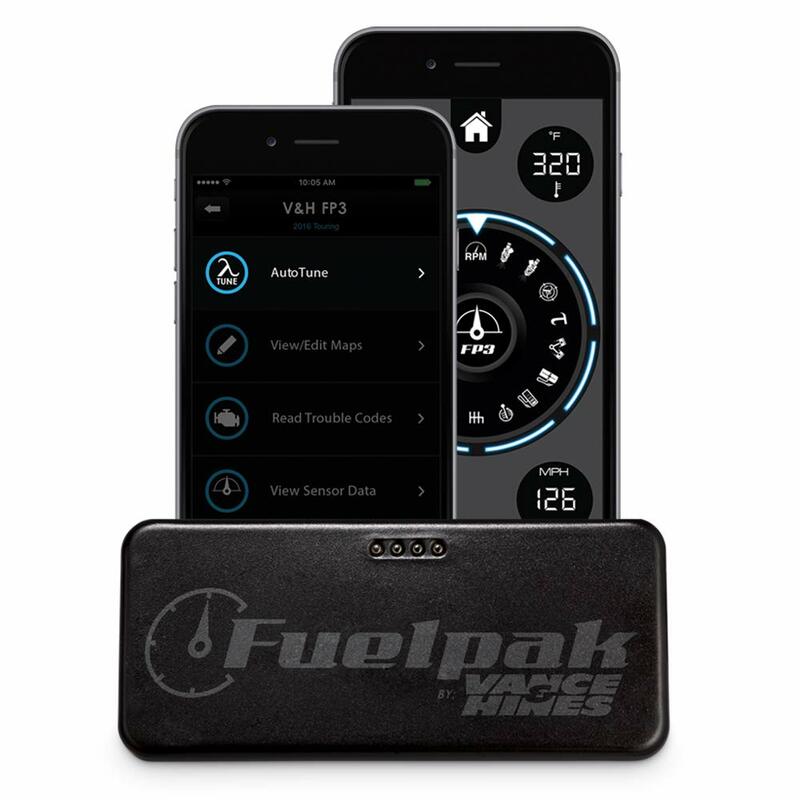 The Fuelpak FP3 uses Flash technology and connects wirelessly by Bluetooth to an iPhone or Android Smartphone. This model is used to recalibrate engine parameters and is also used to map exhaust systems and provide many performance upgrades. The large library of tunes will give you the ability to monitor your ride, read and diagnose trouble codes, and watch live data on the fly. Among the many readouts are RPM, engine temperature, battery voltage, and fuel economy. You also get the AutoTune tool that gives you the power to tune your bike, and you can tune it as you ride it, using the stock O2 sensors. This tuner will let you calibrate for cleaner air, exhaust modifications, and camshaft combination. You just place the mode into AutoTune, and the system does the rest for you. The other feature is the Advanced Tuning tool that gives you full access to critical ECU tables in the app. you can change your idle RPM, raise your rev limit, add aftermarket camshafts, and adjust more tables that include VE, Air Fuel Ratio, and spark advance. This is a great device for improving your bike in any one of the models mentioned. It is set in the higher price range, but as a Vance and Hines model, it is one of the best and only good tuner for these applications on the market. 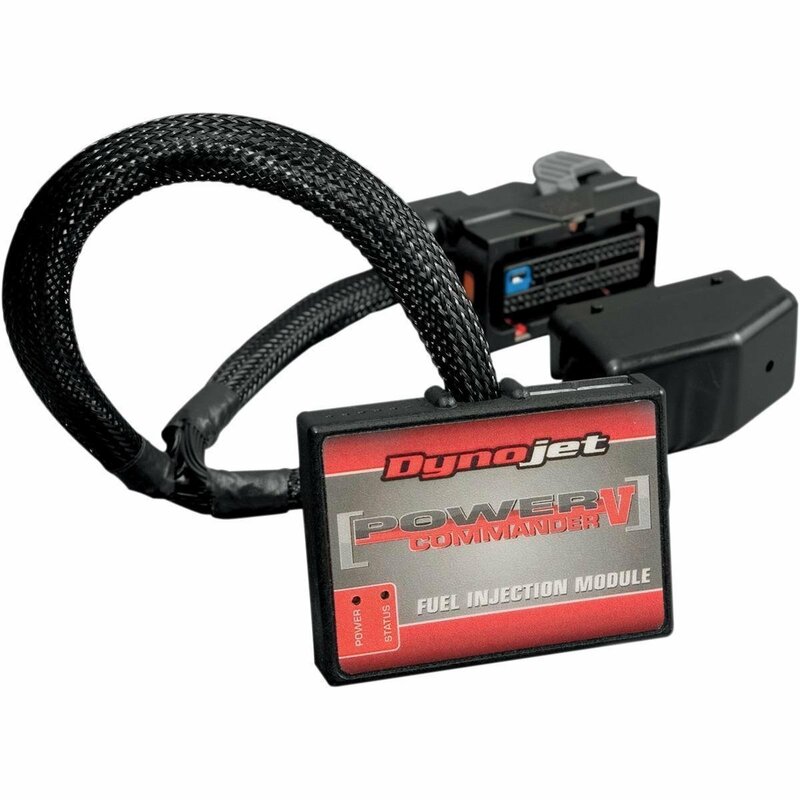 The Dynojet Power Commander V Product is an exceptional tuner for specific models. This is a smaller PCIIIusb model that is powered via a USB port connected to your computer. It comes with a built-in 2 position map switching function and allows you to map gear input. The analog input enables you to install any 0-5 volt sensor; then you can create an adjustment table based on the inputs. The PCV is capable of allowing each cylinder to be mapped individually and for each gear when the gear position input is connected. You get a -100/+250% fuel change range and 10 throttle position columns. There is also an enhanced “accel pump” utility and a built-in Ignition Control. This model gives you +/- 20 degrees of timing adjustment, and you can adjust the timing per cylinder. Some models come with a built-in rev limiter, and a Bosch 3 bar MAP/Temp sensor for the PCV harness. The 15-004 model Power Commander V provides solutions for turbocharged or supercharged applications. This model comes with an average price tag but delivers great performance, so it’s not heavy on the pocket, but is great in providing service. 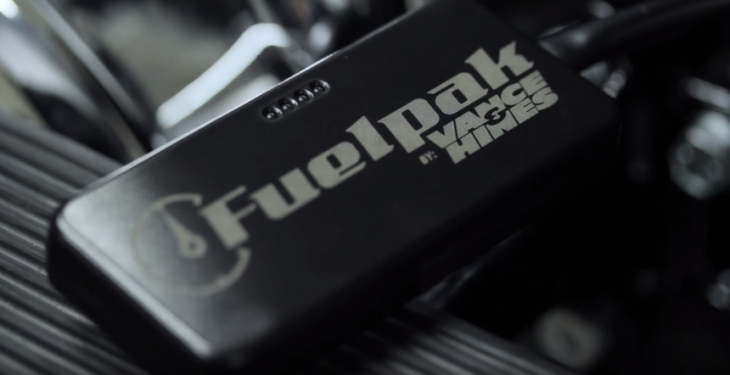 This is the Vance and Hines FP3 Fuelpak 66007 model, which is identical to the 66005 model reviewed above, but for different HD models. This Fuelpack FP3 supports the following bike models. As this is a Fuelpack FP3, this model will deliver the same functions and features across different models. The large library of tunes will give you the ability to monitor your ride, read and diagnose trouble codes, and watch live data on the fly. You also get the standard vast array of readouts including RPM, engine temperature, battery voltage, and fuel economy. There is the AutoTune tool that gives you the power to tune your bike, and you can tune it as you ride it, using the stock O2 sensors. This tuner will let you calibrate for cleaner air, exhaust modifications, and camshaft combination. You just place the mode into AutoTune, and the system does the rest for you. You also get the Advanced Tuning tool that gives you full access to critical ECU tables in the app. you can change your idle RPM, raise your rev limit, add aftermarket camshafts, and adjust more tables that include VE, Air Fuel Ratio, and spark advance. This is another well-balanced device that is perfect for specific application performance enhancements. It is also set in the higher price range, but as a Vance and Hines model, it is one of the best and only good tuner for these applications on the market. 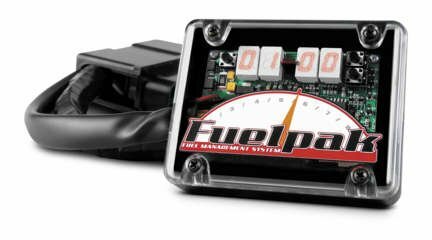 The Fuelpak LED is a plug-and-play fuel controller that provides you with customized mapping for all Delphi fuel injected Harley-Davidson models. This unit uses SAE J1850 that install in-line with the ECM and modify the output signal to fuel injectors. The Fullback LED System utilizes the throttle position sensor which simplifies fuel injection tuning process. You can basically fine-tune the fuel mixture at the touch of a button, and immediately improve throttle response while increasing power. This is a nicely priced tuner for most Touring models, it won’t burn hole in your pocket, but it will improve your bikes performance and give you a burning hot ride. The TTS MasterTune Single Bike Kit 2000008 is the top end tuner for specific applications, which are actually a lot, and that’s why this extensive model is also the most expensive model. 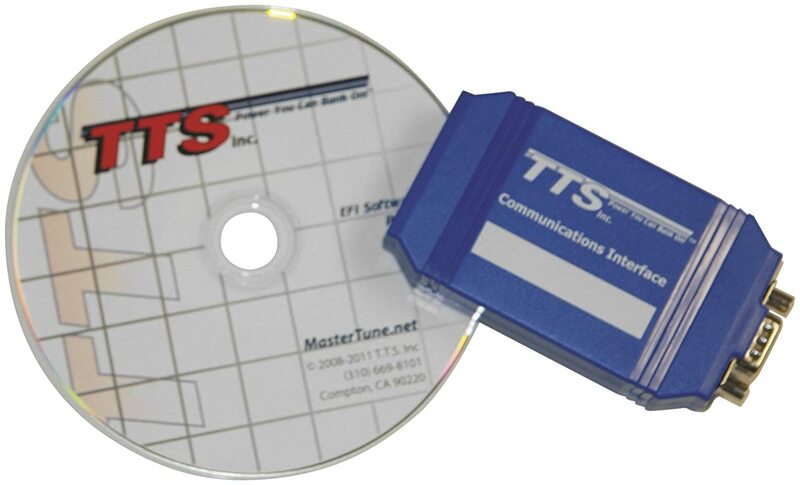 As you can see, the MasterTune2-HD is versatile, and with this versatility comes added performance enhancements that start from this being a Windows-based ECM calibration development tool. The main features that this model provides includes saving the original factory calibration to memory, and then, when needed, restoring the original factory calibration back into the ECM. You get preset limits; this stops the untrained and the over-clever from adjusting values beyond reasonable settings. Apart from storing the original factory settings, you also get storage slots for edits. This model gives you both 2-D and 3-D table is graphing to help visualize tuning maps, and you can compare functions quickly, and identify changed regions in the tables. This model lets you export to print table graphs and table values. Clear DTCs once repairs are completed. This is perhaps the most comprehensive model on the market, the price definitely suggests it’s a leader, and when you delve into its functionality, you find it is exceptional. If you ride a lot and need that extra performance, this is the model you want to have, so long as your bike supports this device.